Each of the last five days leading up to the DCI Tour Premiere presented by DeMoulin Bros. and Co. on June 21 in Detroit, Drum Corps International will be taking a look at where each of its World, Open and International Class corps stand competitively and artistically entering the 2018 campaign. Continuing with DCI’s Southern California and Arizona corps, here’s the fourth installment in a five-part series previewing the upcoming DCI Summer Tour. 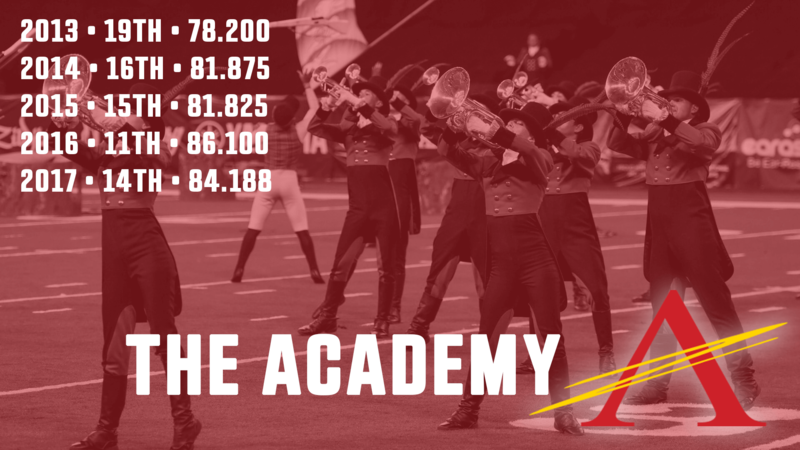 Competitive Refresh: The Academy’s final score of 84.188 in 2017 was its highest in a decade aside from the corps' 2016 World Championship Finals appearance. The Arizona corps’ top marks came in brass and overall music, but its efforts fell about two points short of a second-consecutive Top-12 finish. At the tail end of last summer's campaign, The Academy nearly relinquished 14th place to the Colts, before coming back to top the Iowa corps by three tenths of a point in the World Championship Semifinals. Trending: After a 19th-place finish in 2013, The Academy has spent the last five years quickly rising through the rankings, with a 15th-place finish in 2015 leading to 11th-place in 2016 and an inaugural appearance in the DCI World Championship Finals. In 2017, the corps took a step back competitively, but has still, generally speaking, seen steady improvement over the past several seasons. A Taste of the Music: Gold will perform an entire show of original music by Scott Director. This is Director’s seventh year writing the music for the corps' production. Competitive Refresh: After back-to-back eighth-place finishes at the 2015 and 2016 Open Class Finals, Gold jumped to seventh place in 2017, its first time breaking 70 points since 2014. Last season, Gold was locked in a tight race, edging both The Company and 7th Regiment, each by no more than two tenths of a point, at season’s end. 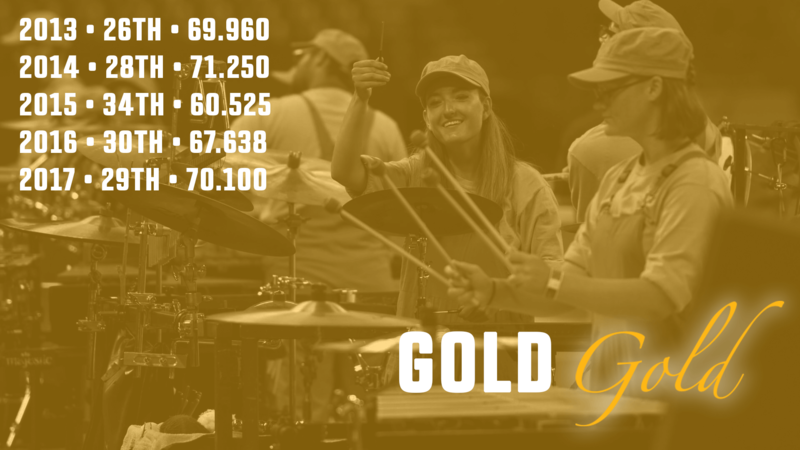 Trending: Gold has earned a top-eight finish in the Open Class division every year since its first trip to the DCI World Championships in 2012. While the corps has never reached the overall Top 25, it has finished as high as 26th twice, just on the cusp of a bid to the World Championship Semifinals. *Golden Empire followed an abbreviated regional tour in 2014, 2015, 2016 and 2017. A Taste of the Music: John Mackey’s music has been very popular with drum corps over the past several years. Madison Scouts and Shadow will both perform Mackey’s works this year, as has at least one corps in all but one of the last 10 seasons. Golden Empire will be the first, however, to perform Mackey’s “Foundry,” when it does so in 2018. 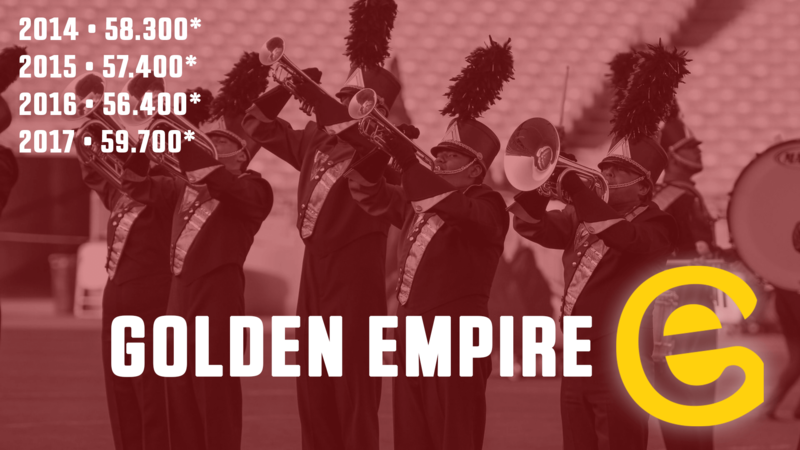 Competitive Refresh: Golden Empire spent early portions of its shortened 2017 season dueling back and forth with Gold, a perennial Open Class finalist, out west — a good sign for a corps that will make its first trip to the DCI World Championships in 2018. The gap between the two grew by the time Golden Empire wrapped up its tour, with the four-year-old corps coming within tenths of its first time breaking 60 points. Trending: Golden Empire saw its best improvement in score from 2016 to 2017, and will look to carry that trend into 2018 when it makes its first appearance at the DCI World Championships in Indiana. *-Impulse followed an abbreviated regional tour in 2013, 2014 and 2015. Its 2013 score was recorded before Open Class corps were judged on the World Class scale for the full season — until 2014, Open and World Class corps only shared the same rubric at World Championship events. A Taste of the Music: In 2018, Impulse — as well as Blue Knights — will be the first corps to bring back Cyndi Lauper and Rob Hyman’s “Time After Time” since Spirit of Atlanta did so in 2003. Competitive Refresh: Finishing behind the advancing top-12 corps, last summer Impulse came within five points of a spot in the DCI Open Class World Championship Finals. Trending: Impulse will look to make steady improvement in 2018 as the organization marks its 20th anniversary season. *-Incognito followed an abbreviated regional tour in 2014, 2015, 2016 and 2017. A Taste of the Music: Popular on the radio, Ruth B’s “Lost Boy” will be a featured piece in Incognito’s 2018 production. 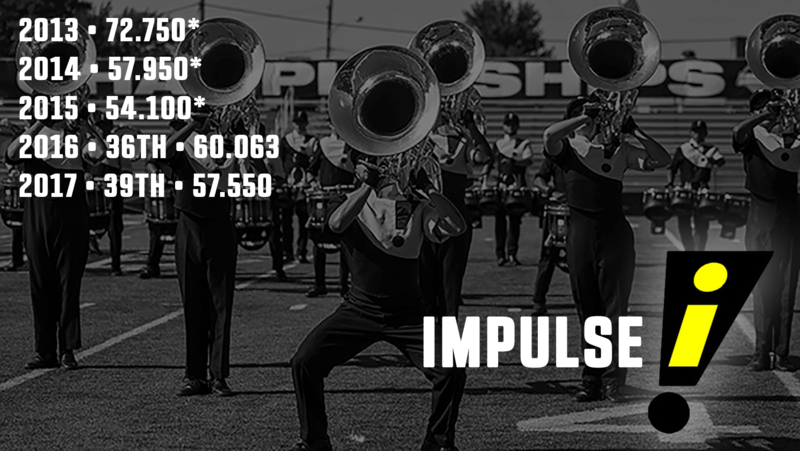 Competitive Refresh: While Incognito spent most of its shortened 2017 tour slightly behind Impulse and Watchmen out west, it held leads over Blue Devils C in each of seven head-to-head meetings. Incognito also broke 50 points for the first time with its 50.400 in Bellflower, California. 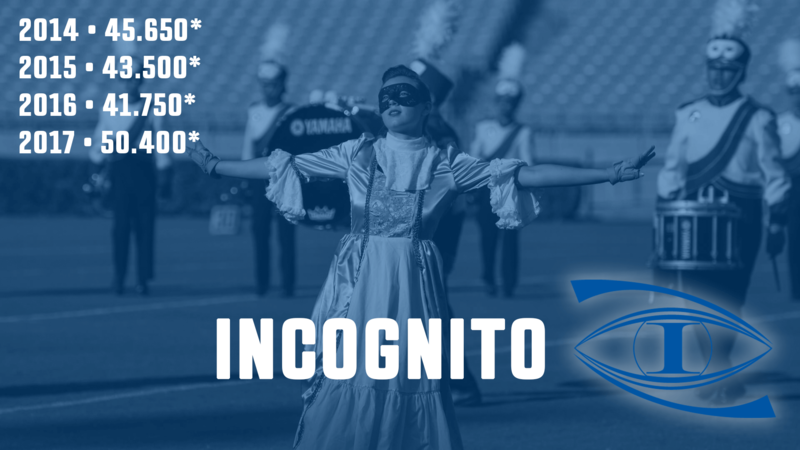 Trending: Incognito’s jump in 2017, in terms of individual scores, was one of the biggest in all of DCI; the corps improved by nearly nine points from its final score earned in 2016. A Taste of the Music: The music of two Academy Award-nominated films will be featured in Pacific Crest’s 2018 production, which brings together the soundtracks from “La La Land” (2016) and “The Artist” (2011). The show draws its name from a lyric used in a song from “La La Land,” called “Audition,” which will be performed as part of the corps' repertoire. 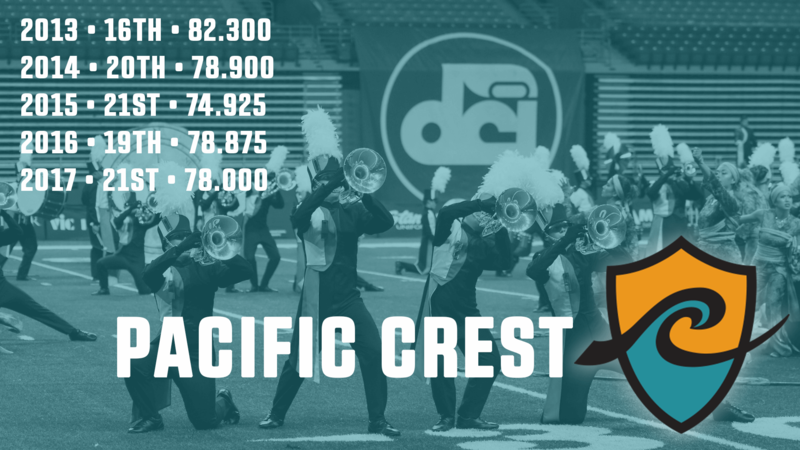 Competitive Refresh: Pacific Crest’s closest competition in 2017 was the Oregon Crusaders; the two had several close head-to-head meetings, the slight majority of which went the way of the Portland corps. Trending: Pacific Crest has never failed to finish in the Top 25 in its 15 years competing at the DCI World Championships. The corps earned its highest score ever in 2013, while also tying its highest placement, originally set the year prior. 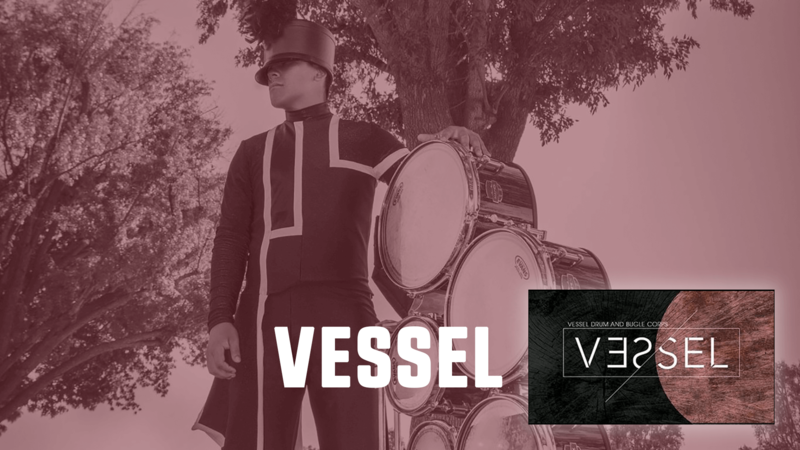 A Taste of the Music: Vessel will perform a full setlist of original works by a trio of designers including Frank Sullivan, Fred Smith and Nico Jasniewicz. Trending: Vessel will make its DCI debut in 2018, having spent five seasons under the heading of City Sound before ceasing operations in 2014. Vessel’s 2018 tour will feature six performances on the west coast. A Taste of the Music: Watchmen’s 2018 program will consist entirely of original music by Harry Hutchins and Paul Rendon. The pair also composed original music for Watchmen’s productions in 2016 and 2017. 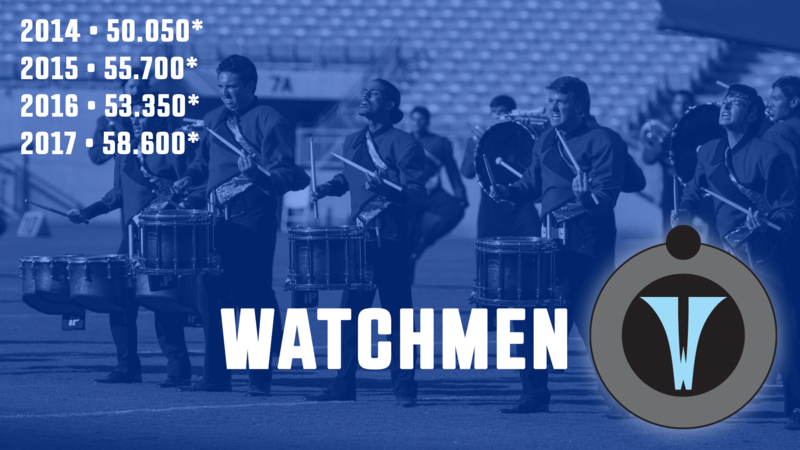 Competitive Refresh: In 2017, Watchmen saw a nice improvement in terms of its individual scores, with its final score being a five-and-a-half-point jump from the year prior. Watchmen held a significant lead over Impulse in the majority of their head-to-head meetings out west. Trending: Watchmen made great strides toward breaking the 60-point mark in 2017, and will undoubtedly be looking to do so in the season ahead. The corps has seen an impressive eight-point improvement since first moving from Drum Corps International's SoundSport program to the Open Class division in 2014. 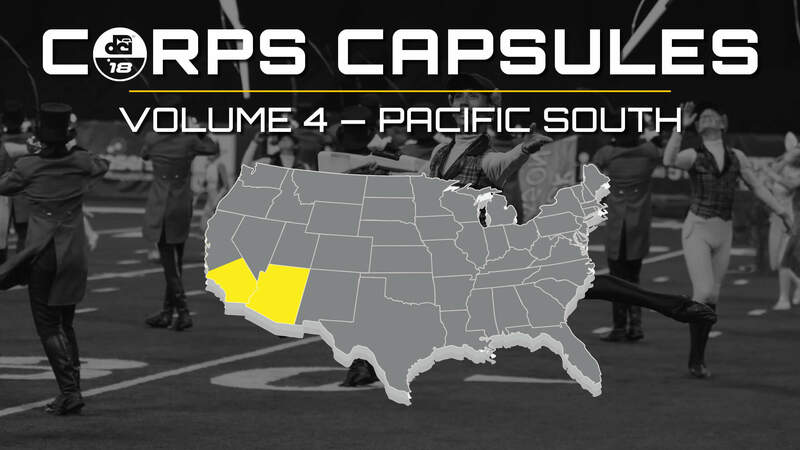 On Wednesday, 2018 DCI Corps Capsules — Volume 5: Pacific North, featuring: The Battalion, Blue Devils, Blue Devils B, Blue Devils C, Blue Knights, Colubmians, Mandarins, Oregon Crusaders, Santa Clara Vanguard, Seattle Cascades, Troopers and Vanguard Cadets.